At this time of year as though we may never see summer again, but it won’t be too long until the sun starts shining and we’ll be able to enjoy blue skies and warmer weather once more. Summer isn’t the only time you can go on a Norfolk Broads holiday of course, but taking to the Broads by boat in the deep midwinter isn’t exactly advisable. Instead, we’re going to talk you though the difference types of holiday or day trips offered by Herbert Woods, to give you an idea of the benefits of each and how the time of year you go can make a difference. Herbert Woods cruisers are unavailable to hire during December and January, but for the rest of the year, you can have your pick of our boats – providing you book early enough! There are a great way to see a lot of the Broads in a relatively short amount of time. You’ll be able to travel all over, mooring up in one of the many free places provided by The Broads Authority, or for a small fee, at one of the private moorings available. The best time of year depends what sort of trip you’re looking for. Spring time is beautiful on the Broads, but there is the chance you’ll experience wetter weather, while summer is lovely and the weather will hopefully be much better. In summer the Broads are busier, which can be both a pro and a con. If you’re a beginner, you might be more comfortable going earlier in the year when it’s less busy so you’ll be able to get used to handling the boat without the crowds. It doesn’t take long to pick up though, and in the busier season you’re more likely to meet like – minded individuals and maybe even make friends for life. 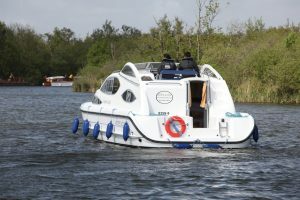 Hiring a cruiser isn’t the only way you can enjoy a Norfolk Broads Holiday. Our cottages are based on the banks on the River Thurne and within the Broads Haven Marina, and can be a great base for your adventure. From our centre in Potter Heigham you’ll be able to easily travel north or east to the beautiful Norfolk coast, west to Norwich and south to Suffolk, and everywhere in between. With plenty of walks and activities to do throughout the year, there really isn’t a bad time to come and stay in one of our lovely cottages. A benefit during colder and wetter times is that if you don’t fancy facing the elements you won’t have to, but when it’s looking brighter you could take out one of our boats for a day. There are three different season in which you can hire our day boats depending on the time of year you’re visiting. They’re the perfect way to explore a bit more on your Norfolk Broads holiday. Low season in the beginning of the year, or towards the end of the holiday season, will be much quieter. It’s also the cheapest time of year to hire one of our boats. You might experience colder, wetter weather, but the low season runs right though until May 27th, so there’s bound to be some sunny days in their somewhere. As you can book in advance, or, if the weather is a worry, book on the day. Mid season is the best of both worlds. You are more likely to get good weather, but as this is still during term time, you’ll find it is still not too busy on the water. Boats are hired out on the first come first served basis, so make sure you book in advance on weekends. This is the peak period. School have broken up, so it’s likely to be busier. There is always a reason that this time of year is going to be busy, and it is because it’s the perfect way to spend a summer’s day. You’ll get some glorious summer days, so remember your sun cream, and a hat. Essentially, you can go on a Norfolk Broads holiday any time of the year, it’s just the case of finding a balance between good weather and how busy the waterways are. 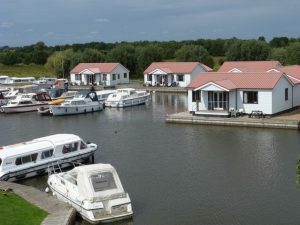 If you prefer a quieter trip, you might need to compromise slightly on the weather, but if weather is the most important aspect for you then you’ll be better booking a Norfolk Broads holiday in the summer months. Just contact us if you’d like any more information or guidance.